We Thank Our Users for their Idea Exchange contributions and Feedback. In this preview we will provide you with Version 9.5 Sneak Peek of New Functionalities to help streamline workflows. Several of these improvements that came directly from you, the everyday user. CollaborateMD, built by engineers, approved by users! With v9.5, users can now print a specific portion of the payer generated EOB report. You can chose between one claim or as many specific claims as you need before printing the EOB. With V9.5, users can now specify a default charge status for procedure codes when adding charges to a claim. Many users need to keep track of certain codes which should not be billed to insurance or be able to automate charges to be set to Balance Due Patient, Paid, etc. This new functionality helps clients prevent data entry mistakes and will save the possibility of causing rejections when certain procedure codes appear on a claim. With V9.5, users can move a patient payment from one charge to another, within the same patient account. No longer will users need to delete a patient payment and repost. Large Medical Offices, Labs and Billing Services may choose to manage their CollaborateMD accounts by utilizing multiple Customer Databases, a great way to keep financials and important data separated. However, when it comes to working reports or exporting the same report for multiple customers, the monotonous one-by-one tasks became time consuming. In v9.5, accounts, with Multiple Customers, can now separate the reports in CollaborateMD by Customer and export the same report for Multiple Customers into multiple files. In v9.5, we have updated the New Patient screen to no longer default the patient gender to “female”. Now the gender drop down will be defaulted to blank and will be required to save the patient record, to avoid mistakes and ensure the record is correct, before saving. Within the Practice section, users can specify a Default Gender for New Patient, if desired. 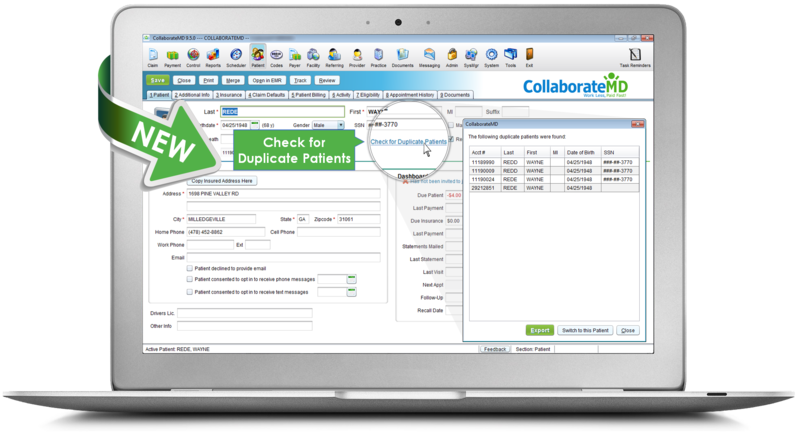 In v9.5, we have updated the “Duplicate Patient Warning” to allow users to close the current patient record and then open the detected duplicate record. Now, when users have an alternate payment source, you will be able to make invoice payments using ACH or CC information not previously saved as a Payment Profile (Admin Section). When doing so, you will be given the option to “Save” the payment information as a Profile for future use. This time saving feature will allow Billing Services to edit several users within their Billing Service Customer and grant Group Access to any New Customer database that is added to your Billing Service Account. No long will you need to open each user individually to assign Grouping Access.